At the so-called “Eutectic point” the liquid will suddenly transform into a solid state. Some solutions are Glass forming and do not have a sudden transformation from liquid to solid state. They just become more viscous as the product temperature falls. The higher the level of sugars, acids and organic solvents, the lower the freezing point. A vacuum source is necessary to allow the process of Freeze drying or vacuum concentration to take place more efficiently by removing the air and thus reducing the pressure in the system. With Freeze drying, in order to start the removal of moisture in the process, the pressure surrounding the material has to be brought down to a value below the triple point value whilst still keeping the temperature of the product below the freezing point. With vacuum concentration the state may still be liquid and the centrifugation force will keep the liquid in the tube preventing bubbling and bumping. The condenser trap within a freeze drying system must always be brought down to a temperature at least 10 degrees below that of the material being dried. This is to create a sufficient pressure difference to allow sublimation to occur. In vacuum concentration the condenser trap temperature must be as low as possible to be sure to trap all liquid before it reaches the vacuum pump. During the primary drying process of freeze drying, the solid water (ice) moves from the product at low temperature and pressure, fl owing through the freeze drying system as vapor, by a process known as sublimation, to the condenser where it re-condenses back to ice. The energy for this process to occur is applied as heat to the product and the product water vapor pressure and temperature will be somewhere on the solid / vapor state transition line. In vacuum concentration the sample is normally not frozen, so this stage will be by evaporation rather than sublimation. The energy needed will be the equivalent energy required to melt the ice and/or evaporate the liquid. The vapor will fill the freeze dryer/vacuum concentrator and eventually reach the Condenser trap. As the trap has a lower temperature, and hence lower water vapor pressure than the product, the water vapor will condense back to ice on the condenser surface. This stage is called the primary drying. 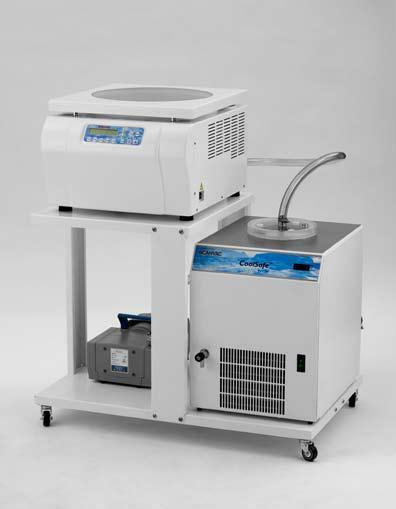 If too much heat is applied to the sample, such that sublimation takes place too rapidly, then the condenser may not be able to remove this energy and so the vapor will not condense fast enough. This can lead to a rise in the condenser surface temperature and the resultant vapor pressure increase in the freeze dryer may result in melting the product. Product heating has to be optimized through experiment so that the capacity of the trap is not exceeded and so that the temperature of the product is not above the value that is known to destroy it. The heating must still be fast enough to enable freeze drying/vacuum concentration within a reasonable time. After removal of moisture in the sublimation (or evaporation) step there will normally be some residual moisture in the product. This moisture is bound to the product in such a way that the moisture vapor pressure at a given temperature is much lower than the moisture vapor pressure in its free form. The removal of moisture in this, the secondary drying phase, is done at high product temperature, because now the product will not lose its biological activity.